Instead of promoting assimilation, the Obama administration is promoting the opposite. It now wants states to encourage students to retain separate languages and cultural attachments. This new policy doesn’t formally compel states to act, but failure to comply may result in the loss of federal dollars. The Administration’s recommendation risks deepening cleavages in American society by perpetuating cultural splits. Its proposed action would not help promote the linguistic skill most highly correlated with success and assimilation in the U.S.: English-language proficiency. Do you think the government should promote assimilation, or should government promote ethnic divisions as the Obama administration proposes? 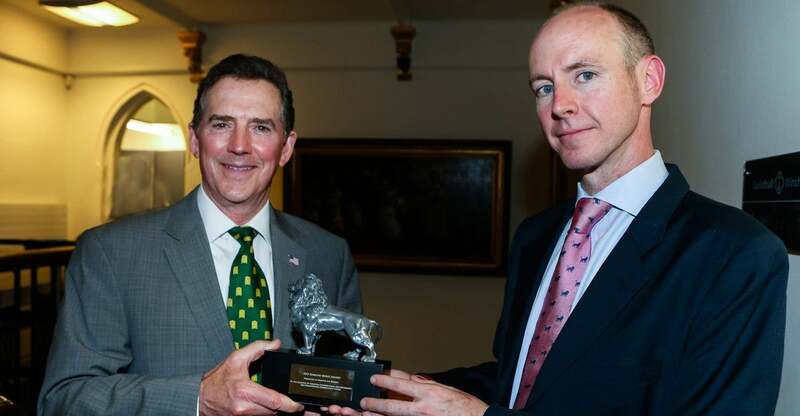 On May 22, the Alliance of European Conservatives and Reformists presented their first-ever Edmund Burke award to Heritage President Jim DeMint for his work to advance conservative principles. No top-down control can force goodwill, but it is very likely to destroy it. True patriotism and brotherhood flourishes when men and women are allowed to be masters of their own spheres. It is a cruel irony that any authority, with the pretense of celebrating diverse cultures, demands they all fit the same mold. I have been saddened to see this trend in the United States. Americans live under an administration that runs roughshod over their rights and traditions, and accuses those who stand against it of being bigots, or clinging bitterly to guns and religion … Two things, I might add, that our Constitution gave us every encouragement to cling, so that a demagogue could not take more power for himself. Far from being unified, top-down policies have divided my countrymen further than ever—whether by race, riches, or faith. But there are many who are fighting back, who are rebuilding the “little platoons” of society—their communities, churches, and local governments—working toward prosperity, self-sufficiency, and independence. They do not hate their country because of those in power. They love her in spite of them. You can read all of Sen. DeMint’s remarks on The Daily Signal. “The greatest generation taught us that if you don’t talk about something then things will go wrong fast,” Mattis said. But today’s leaders often ignore the problem and hope it goes away. He warned that ignoring the problems with Russia, China, and political Islam won’t make them go away. Rather, ignoring them will allow them to escalate which could be catastrophic for both the U.S. and our allies. Though things may look gloomy now, he emphasized we can reverse it through the powers of intimidation and inspiration. He has high hopes for the younger generation, which is why he focuses his attention on universities. This leadership can be gained through learning, he said, and emphasized the importance of the reading lists Marines are required to read upon advancing ranks. 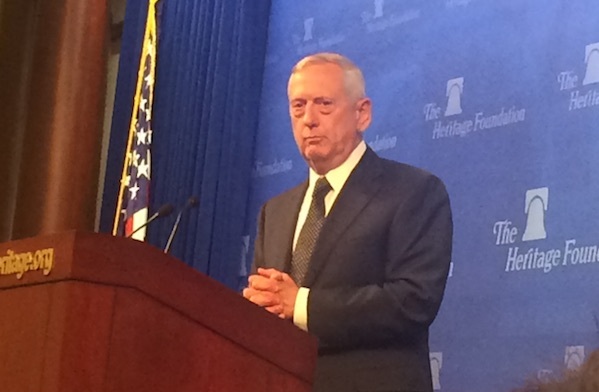 Mattis, a retired four star general in the Marine Corps, delivered the annual Colonel James T. McGinley lecture. Known as the “Warrior Monk,” Mattis served as Commander of the United States Central Command, Commander of the U.S. Joint Forces Command, and NATO’s Supreme Allied Commander. Mattis said he turns down most speaking requests, but since he quotes Heritage research so often, he felt he should accept this opportunity. Do you think today’s leaders have developed a strategy to deal with the world’s challenges? For the last 38 years, Heritage has hosted the annual Resource Bank meeting to bring together conservative leaders and organizations from around the country and around the world. Attendees talk strategy, share tactics and best practices, and work to strengthen the movement. Strategy sessions on issues like education reform, restoring federalism, health care, social services, grassroots organizing, educating more Americans about conservative principles, and more. The awarding of the Salvatori Prize to the American Council of Trustees and Alumni for their “What Will They Learn” project, which seeks to raise education standards. 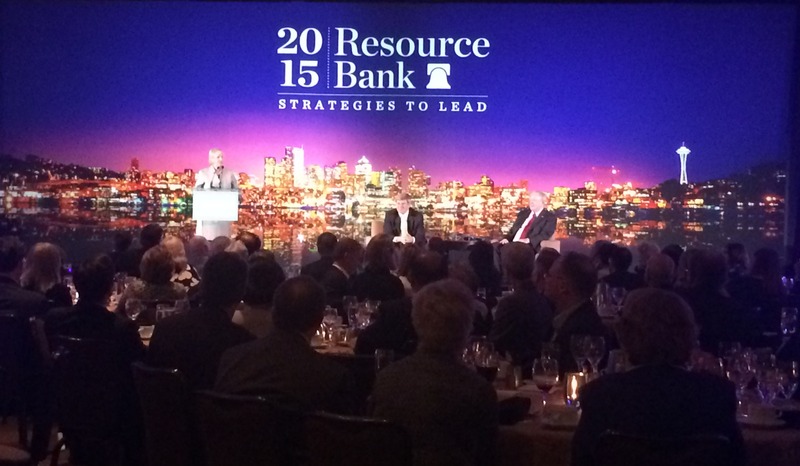 A dinner hosted by Heritage’s Steve Moore and Heritage trustee Steve Forbes. As Heritage Foundation Founder Ed Feulner has always said, it is better to add and multiply the conservative movement than it it to divide and subtract. That’s what Resource Bank is all about. Do you think it’s important for conservatives to work together and share ideas about how to succeed? How Congress Can Use the Power of the Purse to Reform the U.N. The United States contributes a whopping 22 percent of the United Nations’ regular budget. 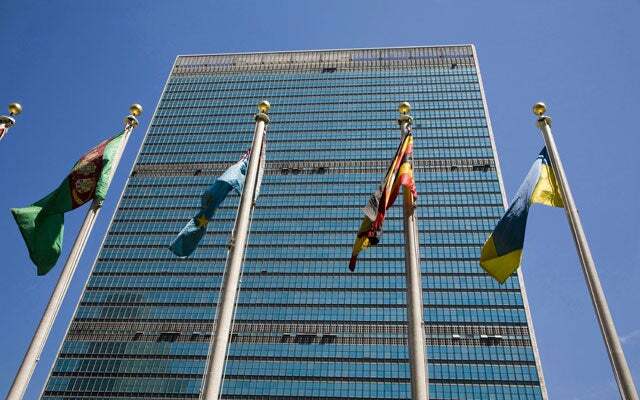 As by far the largest contributor to the U.N., the United States can play a major role in reforming the organization. Give major contributors more influence on U.N. budgetary decisions. Read Schaefer’s full testimony here. Do you think Congress should use the power of the purse to reform the U.N.? Rep. Sam Johnson (R-Texas) introduced a bill, the Wasteful EPA Programs Elimination Act, which he said is a money-saving measure, citing a Heritage Foundation forecast that it would save $7.5 billion over 10 years. States should not be lured by the carrots the Administration is dangling. If Congress wants to help the states, they should not only reject the President’s $4 billion handout but also strip away the Environmental Protection Agency’s funds to implement and enforce any carbon dioxide rules. Now Congress is taking action with Loris’s findings behind them. Do you think Congress should cut programs this like? Three weeks ago, Heritage education expert Lindsey Burke testified before the Tennessee legislature about the benefits of education savings accounts. And in a major victory for school choice, the state legislature passed a bill this week to create ESAs for students with special needs. The bill is now on its way to the desk of Gov. Bill Haslam. ESAs allow parents to direct their child’s portion of education spending towards education options that meet their child’s needs. “They separate the financing of education from the delivery of services and empower families to choose which provider works best for their children,” Burke writes in The Daily Signal. Twenty-two state legislatures are considering ESAs for the 2015 school year. Do you think education dollars should follow the student, as ESAs allow? Follow this link to see the rest of Sherk’s testimony. Do you think Nevada should make unions optional for its government employees? Heritage’s Ryan Anderson is profiled on the front page of Thursday’s Washington Post. 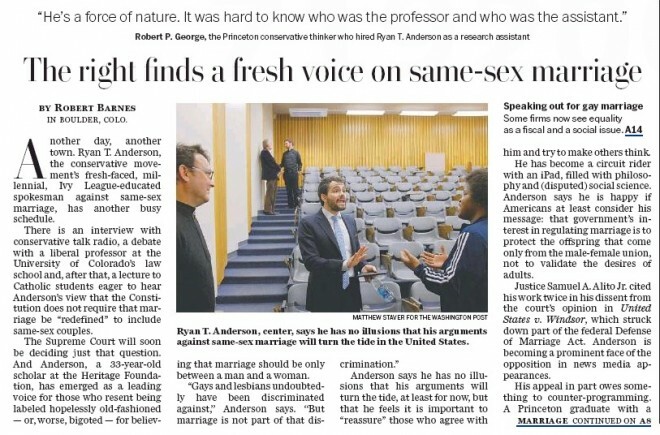 Be sure to read the whole article, which includes praise from the likes of Princeton’s Robert George and even his liberal sparring partners. Do you think conservatives need more young advocates like Anderson to sway more people to the conservative cause? Reintroducing Americans to the Constitution and the Founders’ vision of limited government is the key to reining in government, Sen. Mike Lee (R-UT) said last week at The Heritage Foundation. Lee’s book is far from a textbook on the Constitution, Heritage legal scholar Hans von Spakovsky writes in his review of the book–he keeps these important lessons lively with stories that illustrate the importance of these provisions to the Founding. You can watch Sen. Mike Lee talk about his book at the Heritage Foundation here. Do you think restoring these “forgotten” provisions will help us get America back on track? Tell us in the comments.